On a beautiful summer’s evening almost 50 Queen’s graduates and guests gathered for a special occasion in the Irish Consul General’s residence off 1st Avenue in New York City, to say farewell to the outgoing Consul General of Ireland, Barbara Jones. 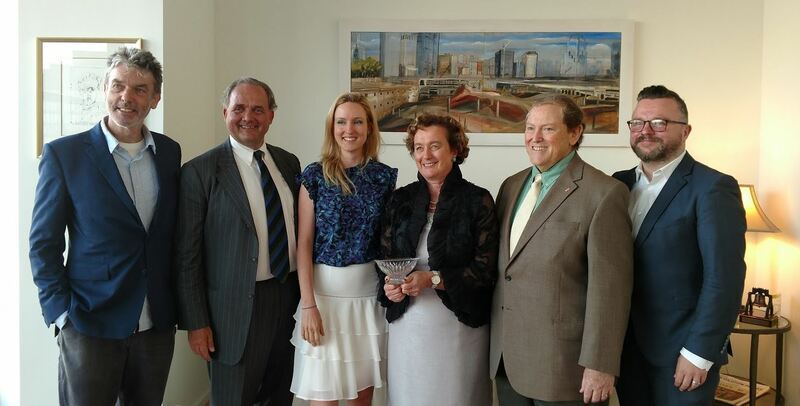 The University’s alumni chapter in New York held a ‘farewell’ Summer Solstice Reception for the outgoing Consul General of Ireland, Barbara Jones on Tuesday 20 June, when among the guests was the University’s Chancellor, Dr Thomas Moran and a group of Queen’s City Scholars. Backed by the Queen's University Association, USA (QUAUS), East Coast – the University’s alumni chapter based in New York – the ‘farewell’ Summer Solstice Reception on Tuesday 20 June was Ms Jones’ last event for Northern Irish graduates and expats. Among the guests was the University’s Chancellor, Dr Thomas Moran, the award-winning artist, filmmaker and honorary Queen’s graduate Marcus Robinson, John O’Donoghue, President of the Friends of Queen’s University and a group of first year Queen’s City Scholars students spending time in New York. Also present were Friends Board members Declan Breslin and Jason McGaughey. John O’Donoghue presented Ms Jones with gifts on behalf of the University and commenting on the occasion, said: “This evening was a great opportunity to network with Queen’s graduates – and friends of Northern Ireland – to say farewell to Barbara Jones, thank her for all her help over the last 3+ years and to wish her well in her new posting. In his remarks the Chancellor Dr Thomas Moran paid tribute to President and Vice-Chancellor Professor Patrick Johnston who died suddenly on 4 June, highlighting his lasting contribution to the University and to Northern Ireland. Born in County Wexford, Ireland Ms Jones had been Consul General in New York since 2014, having previously served as head of humanitarian aid policy in Ireland. She is set to take over as the Irish Ambassador to Mexico, with responsibilities for Colombia, Costa Rica, Cuba, El Salvador, Nicaragua, Peru, and Venezuela as well. Among other guests attending was Mark Fletcher, a young entrepreneur and Queen's Graduate, who is part of the new young group emerging from Catalyst-Inc. Mark, whose offices are on Elmwood Ave, Belfast, has developed a sophisticated FinTech platform for Wall Street investors. He was in New York attending conferences and meeting with Hedge Funds, with the introductions coming from the University’s alumni group in NYC. The Queen’s City Scholars were completing their two week internship in various New York finance firms. The Reception proved to be an invaluable opportunity to introduce them to the University’s US East Coast alumni network. The Queen's University Association, USA (QUAUS) - East Coast aims to maintain links with Queen’s and to arrange regular events for graduates. Formally established in 2002 at an event attended by award-winning poet and Queen’s alum Paul Muldoon in offices on Madison Avenue in New York, the Association caters for an estimated 400 Queen’s graduates living in the region. For further information on graduate activities in the USA please contact Natasha Sharma, Queen’s Alumni Relations Officer, Development and Alumni Relations Office; phone: +44 (0)28 9097 3135. Photo (L-R): Marcus Robinson, John O’Donoghue, Laura Hickey (Deputy Consul General at the British Consulate General), Irish Consul General Barbara Jones, Dr Thomas Moran and Mark Fletcher.